Monday is the suckiest day of the week. Not cute sucky like these colorful lollipops, but drag yourself out of the bed while dreadfully needing another hour, or three, of sleep awfulness. They are especially bad when you have had two glorious weeks of vacation. To all of you feeling the same way I am today, hope this day is a good one for you! You're totally right-- today is pretty sucky. haha. So hard to get back into the groove of work. Those lollipops are super cute though! Thanks for sharing! You know I didn't step a foot outside my door? I'm definitely getting used to this working from home deal especially during this cold winter! Angelina-It is so hard to get back into the swing of things! I was really enjoying staying up late and sleeping in. 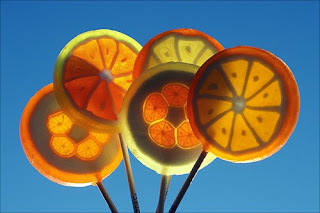 I love those lollipops. I saw them on flickr and thought they were too cute to not share! Dorkys-You lucky girl! That is how I was yesterday. I kept saying that it was my last day off and I needed to get out, but I was in my pajamas until about 4pm! I think working from home would be great! I agree with you on Mondays... I get to do the paperwork / bills / check requests / trash clean up and so forth on Monday mornings. The only thing that helps are a couple humor blogs I read that have monday morning specials. :) I can't help but laugh after visiting them. I think I'll visit your etsy place - I love your attitude - your profile says one more course til you finish design school - is this still the case? Thanks for this great post - I dont think I could say anything else that would do it justice. I like routine, so getting back to my usual isn't so bad. The hard part around here is getting the children back into their routine.